Here at bump HQ we have been discussing how much we smile on a day to day basis – we’re a happy bunch and it is a happy space, especially when someone offers to do the tea round or brings in baked goods! 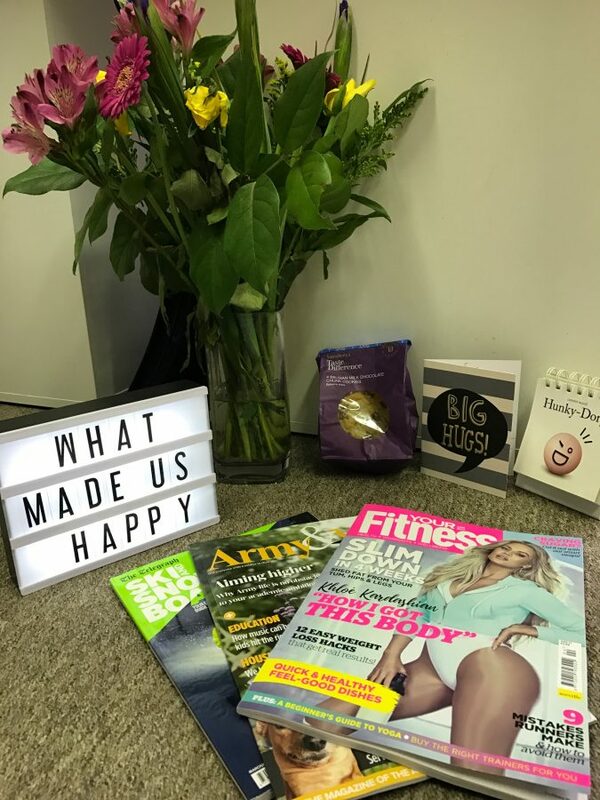 So, as it was my job to write a blog post this morning I thought I would take the time to write about what made us smile at bump last weekThe week started well with a lovely delivery of flowers from Sandy Beales, fabulous famous guitarist. It was a thank you for sending him and Shanna some goodies for the imminent arrival… how thoughtful and it was really appreciated by the whole team. It goes without saying that we LOVE getting coverage and all enjoy seeing each other succeed! However last week was especially good as we were featured in 3 new magazines! Army and You, The Telegraph Ski and Snowboard and finally Your Fitness. This made spirits in the office particularly high (excessive pancakes could have also contributed to this) as we love getting our fab clients in some really cool magazines. As I said before, office snacks are always the best way to make everyone smile, unless it’s a 5:2 day, then you are in trouble! Last Friday, in the absence of the office dieters we had cookies – soft gooey ones that melted in your mouth…. Needless to say we were all grinning from ear to ear! One thing we do love is when we have a break from the radio and blast out our Sonos playlist, which happens at least once every week! An amalgamation of everyone’s top picks, it ranges from Bruce Springsteen courtesy of Chloe to Take That …thanks to Lisa! Finally, the highlight of any bump workers week, is the anticipation of Chili B’s – yes another food related one! Whether you are having a Starsky and Hutch, Bacon Bad or are being really adventurous and get the special, they are guaranteed to put a big smile on your face! Now a week is not complete without a little visit from Toby, who never fails to come in and make us all giggle, he didn’t come in last week though so we’re hoping for a double visit this week! 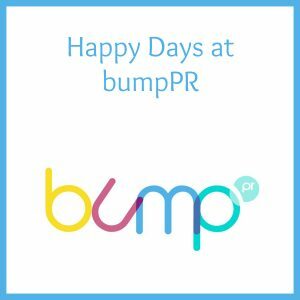 As you can see we are generally a pretty happy bunch here at bumpPR and it really doesn’t take a lot to make us smile.